Honduras In Crisis – The People Say JOH Must Go! 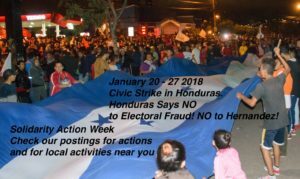 The Honduran people have declared a national civic strike, demanding that Juan Orlando Hernandez give up his fraudulent claim to have won the elections in November and to stop his inauguration on January 27. More than 35 people have been killed by military and police since the November 26th election. Hundreds have been injured and hundreds arrested. Go to our FaceBook Page for frequent updates on the situation and actions.